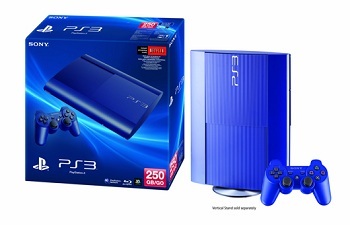 The Azurite Blue Super Slim PS3 will come with 250GB of memory and retail for $250 exclusively at GameStop. While the PlayStation 4 will have a price advantage over the Xbox One at its launch, its $400 sticker price is probably still going to be too much for many people to cough up for a console that, when you get down to it, will be stuck with a fairly limited library of launch titles for at least several months. If you're still in the market for something from the PlayStation brand, however, Sony has announced yet another new model of the PS3 that might just strike the fancy of late adopters. The Azurite Blue PS3 Super Slim will be landing exclusively in American and Canadian GameStops on October 8th, adding a cooler compliment to the Garnet Red console the company put out with a God of War bundle this past March. The Azurite Blue edition will be sold on its own for $249.99 and will come with 250GB of memory. That's a lot of memory for not a lot of money, especially when you consider that the recently announced $200 PS3 only comes packaged with 12GB of flash memory. Even with the PS3 well into its twilight years, we're going to say its worth investing in one if you haven't already. The PS4, after all, isn't going to be backwards compatible and the PS3's software selection at this point is large, varied, and packed with quality titles that will go a long toward keeping you entertained as you wait for the game libraries of the next gen consoles to expand a little more.